The top fillies and mares on the peninsula are in Busan this weekend for the KNN Cup, the 2nd-leg of the 2014 Queens’ Tour. Ttukseom Cup winner Gamdonguibada will renew hostilities with Indian Blue and Joy Lucky as a full field of 16 takes on the mile-long test. She wins from the front and will likely look to get there early. It’s been a long time since she’s done so successfully though and on recent form is very unconvincing. She was 6th in the Ttukseom Cup and that would appear to be the extent of her ambitions here as well. The booking of Holland is a bonus but even so, a place seems her best hope. The only 3-year-old in the field, she was a smart winner over 1400M last up. She has the speed and looks like she can go further but company of this calibre may be a little too much too soon. Exceptionally impressive leading from gate to wire in the Ttukseom Cup, she’s not been seen on the track since except for a race trial in early May – exactly the same prep she did for the Ttukseom. Joe Fujii, who won the Grand Prix on her, returns to the saddle and she’ll be tough to oppose. 4th in the Gukje Sinmun Cup last month, she usually goes close but rarely wins. That’s likely to be the same here. Came from just off the pace to grab a class 2 victory in March but was poor last time out on her class 1 debut. Likely to find the going similarly tough here. Was 10th first up after a long layoff last month. Desperately needed the run but is unlikely to have come on well enough to challenge here. A nice looking filly who comes into the race in good form. She likes to start slow and then pick them off in the straight with good late speed. Could be a threat although this is by far the toughest field she’s faced. 2nd in the Ttukseom Cup, she came back out and won last time over a tough class 1 field. She’ll be looking to go past the frontrunners in the home straight but can’t give Gamdonguibada such a head start this time. A chance. Bart Rice lets Kalma take her chance again but there’s little in her recent form to suggest she has any chance here. She’s only monied once in 6 tries at class 1. 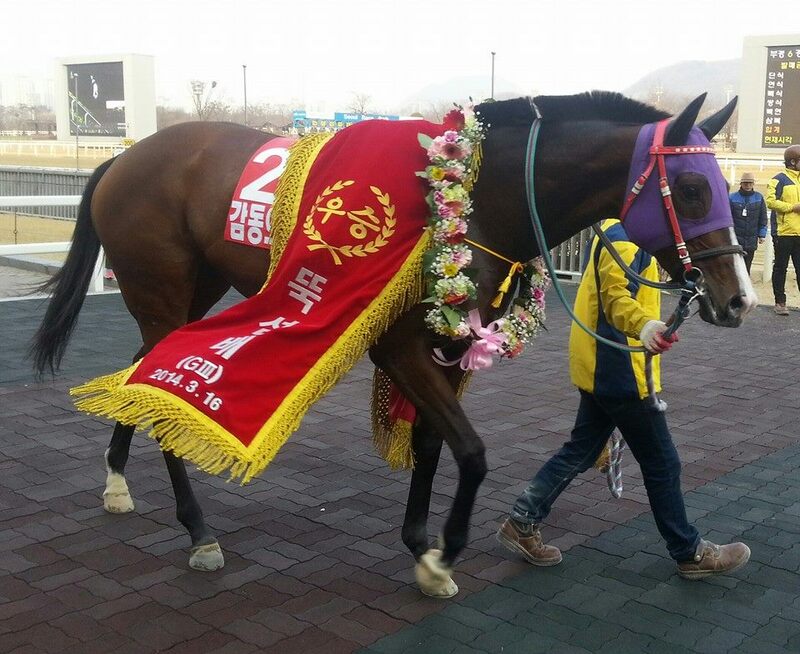 2nd to Secret Whisper on her only previous visit to Busan but was poor in the Ttukseom Cup. She bounced back to win the Owners’ Trophy in April and was an impressive class 1 winner last month. She’ll be at the front but can she hold off Gamdonguibada? The suspended Seo Seung Un is replaced by moon Jung Kyun in the saddle. Bart Rice’s better chance is an intriguing prospect who comes into the race off the back of 4 straight wins. Likes to close from just off the pace but is untried at a mile. Her only starts at 1500M have met with failure there is a question mark as to whether she will stay – but that was last year under a different trainer. If she does stay, she’ll be dangerous, especially if the leaders race themselves out of contention. A closer who has quietly made her way to class 1. A mile has proved slightly beyond her to date and this could be her weakness here too. Never won and as she is yet to graduate from class 3, that’s not likely to change here. Well established at class 1 and another who has an outside chance to close late for a place if the pacesetters blow themselves out early.